"You will have disputes over creative input. A player might feel another player’s or referee’s addition to the Game World isn’t appropriate, or a referee might think a player’s input just doesn’t fit in. If a creative dispute comes up, everyone should work together and resolve it - with as little hard feelings as possible. In traditional roleplaying games, the referee is given ultimate authority over settling disputes. The referee’s overly harsh “six-gun justice” of shooting down anything constructive a player has to offer turns off players, and can lead to hard feelings. In SBRPG, the referee should stop and think outside strong personal feelings and biases, approaching a dispute like a careful judge in a court of law would. Solutions should respect the original creator’s intent, but respect the shared vision of the Gaming Group’s original idea for the Game World. The referee has the final say when a dispute can’t be solved. This “final option” of imposing a solution on the players should never be used, but should be available should things get out of control. When the Gaming group picks a referee, the group is trusting that individual to be impartial, and use this power responsibly. Solving disputes together as a group of friends is preferable to having one person impose a forced solution on everybody." "Respect the creator's original intent." If a player creates a team of elite crack commandos their character is a part of, the referee can't turn around and make that entire team the villains of the game, turning against the player's character. The creator's original intent was 'be a part of a cool team of good guys' - and that can't be violated. If there is a dispute, the entire group works it out, and the referee works it out. That said, if a solution absolutely can't be worked out, it falls to the referee to be a final, fair judge. In most cases in our playtests, it never fell to that, and people generally worked together and were respectful of each others additions. Most disputes were handled on-the-side, a player would say, 'wait, maybe this would be better' - and the group would discuss quickly, and play would resume. The area referees needed to be careful was in secret plots or other behind-the-scenes stuff that would change a player's addition substantially later on. In practice, players created things they knew the referee was going to shape and meld, it was always cool as a player to create a mysterious group of enemies the commandos were after, and then gave the referee free reign on determining who they really were. People out to rule the world? Aliens? Half-animal mutant soldiers? Criminal masterminds? Who knew, but whatever they were, people were always surprised at how things came out. "The players own 50% of the Game World, and the referee owns the other 50%. This number isn’t intended to be a voting block; it’s an expression of the responsibility the players and referee share to keep the game on-track, sticking to the selected Genre, and keeping the game free from arguments. Ownership doesn’t mean, “I put this in the game, it’s mine.” Ownership is a responsibility to respect, protect, and accept another player’s or referee’s creative input as being part of the shared experience of SBRPG. Once a player or referee adds something to a Game World, everybody owns it. The referee is responsible for running the show, so the referee has the greatest responsibility. If a player adds a location, idea, or NPC to the game; it’s up to the referee to interpret it, link it to everything else the Game World, and make it come alive. The players’ responsibility is shared, because the players have to respect each others input, and agree the referee has the right to creatively interpret their input. If a player adds an NPC to a Game World; the referee is free to take that NPC, and mix it with locations, NPCs, Factions, and the players' ideas." Again, another quote pulled from the Playing the Game chapter, and a fun one. The group creates the world round-robin, even during play. If a player's turn comes up, and their space armsman is just sitting there in limbo, it is the player's responsibility to set the scene, come up with the ship the character is on, details about the stellar navy, where in the command rank the character resides, and anything else the referee needs to start that character. That 'content' is written down, notes are made, and it is added to the game world. From there, the referee takes it from there, maybe space aliens attack, maybe the armsman's ship receives a distress call from a liner under attack by pirates, or maybe the ship happens upon a hastily abandoned outpost. Next player goes, and more is added. The referee can get into the act too, interpreting whatever the players come up with. Eventually, the creation parts settle down, and more and more becomes established. The group then plays in the sandbox, and whenever new material is needed, the creation process fires up again, and more notes are made. The quote above describes 'who owns what?' - and the answer is 'everybody.' Everyone's contributions are equal, changeable by anyone, and owned by all. Players can change details about the referee's NPCs, the referee can interpret player's NPCs, factions, and locations as the referee sees fit, and everything starts in a highly morphable state. As play continues, things become 'set', and the group agrees to play things how the lie, it is a natural process, and one that is built into the game. It seemed like it would never work - but in all our playtest groups, it worked surprisingly well. Players were delighted to be a part of the creative process, and a huge burden was lifted from the referee's shoulders to create everything. Most all our playtest players acted responsibly too, understanding they weren't there to create things to help themselves 'win', but to create things in the sandbox to enjoy with everyone else. I updated the background to an original image, one of the classic sheets of yellow paper we used to design the original version of the game. Let me know if it hurts the eyes or renders badly. Myself, I think it's kind of cool, and it fits the whole WIP vibe of this blog. Plus it doesn't have a problem of scrolling off the bottom of the blog, it tiles nicely. To 20-side or Not to 20-side? 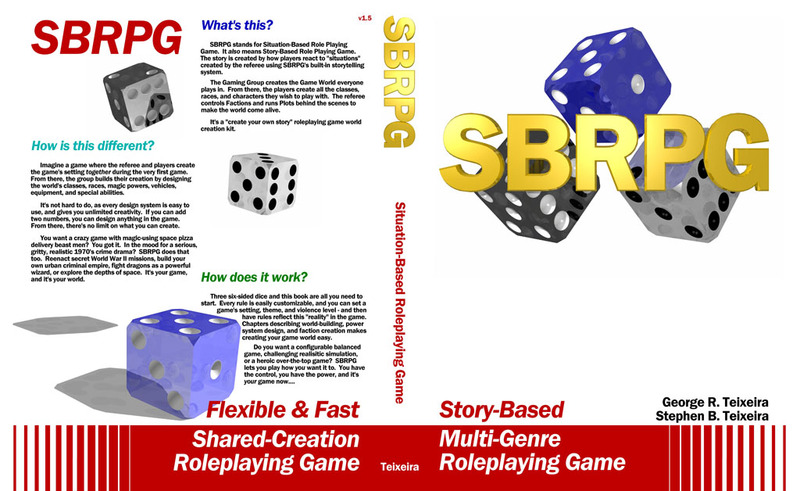 The original SBRPG system was strictly a 3d6 system, we loved the bell curve, we used d6's for everything, and it was meant to be a RPG you could play with the spare parts out of a Monopoly set. Part of the appeal of the game was that you could put together a game anywhere, out of anything, six-sided dice, paper bags, pencils, rulers, and paper ripped out of your printer. I have some ideas about making SBRPG 2.0 compatible with the old-school 20-sided games and the huge amount of material out there. I don't want to craft another old-school clone, there's plenty, I love them, and they do what they do incredibly. There is room for a generic, story-based system, written along the lines of an old-school game, and semi-compatible with monsters, spells, and worlds of old-school gaming. Take the best parts of SBRPG 1.0, and make a story-based, old-school world creation game out of all of it. It is a tough thought, and I love our 3d6 system, but the whole point of writing a 2.0 system is to do something new, take a new look at things, and think different. It's not going to be a dungeon game clone, but it could be an interesting alt-take on the whole old-school movement in a new direction. Keep what's familiar, allow people to play with old-school monsters and magi, and let people experience things in a new and cool way. A thought struck me, if SBRPG is all about 'create your own stuff', then why port in the old stuff from the old-school games? It does violate our 1.0 manifesto, but it is cool, and a whole new take on things. Maybe letting some old-school stuff port in would open a couple doors for new players, give them something to start with, and give them a base to imagine what could be. It could be parts of the manifesto were too absolute and restrictive, and it is time for a little more openness. Times change, but who knows? Make dungeons or write modules. SBRPG was meant to play 'live' with no preparation time, the sandbox and factions handled everything, and the referee dealt with everything as play happened. Port in other games to these rules. We didn't want you playing Star Wars (tm) with SBRPG, or porting in your favorite fantasy game world. One of the ground rules was you needed to create something new to play. Port in classes from other games. Similar to above, please don't port in your World of Warcraft shaman into the game, all classes had to be original creations. Limit yourself to other people's ideas. Feel pressured to accept other people's ideas as law. This covers fiction, other games, movies, or anything else that could limit your creativity. This basically gives you a right to ignore it. Think your ideas are stupid. Creating new stuff is hard, and hard to get buy-in. People are afraid to be creative, for the vast majority of people outside of RPGs, we have encountered the feeling that, "Oh, my ideas are stupid and no one wants to hear them." Let publications, the Internet, chat rooms, or others tell you what to think or feel. Again, a defense against toxic attacks from the Internet that could derail your creations. Be overwhelmed by floods of news about other games, releases, or the noise of websites or magazines. People want to sell you stuff. Haha, people do want to sell you stuff, and too often, you toss your creations out for the cool new thing on the shelf. Assume quantity equals quality. Just because other games have more monsters, gear, worlds, NPCs, rules, or books doesn't mean anything you create is worthless. A big one. Our shelves are filled with games where the sheer weight alone says 'play me.' Also, there is a tendency to feel other games are better because they have more. This is 'start-up protection' where creators give up in the face of having to create something equal to what's on their shelves. Assume your current RPG collection is gold - what are they really? Half of what's in the books are lists of stuff you will never use, and the other half are combat rules. How much of those books inspire you to create a story, world, or your own unique creation? A second point to the preceding one, a bit sarcastic, but funny nonetheless. Most RPG books are filled with lists and lists of stuff, powers, spells, equipment, monsters. When you say 'that stuff is not important' - what do you have left? And yes, the line about half of the book being combat rules was smarmy, but too often true. Trust a game company (even us) unless you really like what they did. We have been burned by companies releasing official stuff that we inadvertently introduced into our campaigns, and it spoiled everything. Save your original conception about what a game is about, and be wary of expansions and new material. If you create all your own stuff, you are mostly immune to this. Play a game because you spent a fortune on it. Think a game is the 'end all' of RPGs (even this one). Yep, all games are never the answer for everything. Something new and cool will come out next year. If you like something you are playing though, stick with it. Buy a game for its name. True, sometimes games go downhill in new versions, and lose what made them special. Just because a game has a name, doesn't mean it's any good. See also: Hollywood sequels. Be intimidated by other people's ideas of what's right. More of the 'your ideas are gold' defensive material. Think you need to play with other people's IP and copyrighted material, you own creations and ideas are often superior. Well, there you go, our crazy manifesto of don'ts for the SBRPG game, and a lot of those ideas were cleaned up, made less negative, and incorporated into the game. We had some negativity in the first draft of the rules, and we purposefully went through and eliminated it in our revisions. In a game about 'creating your own cool stuff,' razzing on other people's games or ideas seemed petty, and it was. Our writing matured, and SBRPG was better for it. Delta was born out of disappointment with how the a certain post 3rd edition miniatures-based fantasy RPG ended, and a lack of faith of the direction in the game's future. We enjoy nothing more than playing tabletop strategy fantasy RPGs, and love the whole hobby of creating terrain, collecting figures, building characters, and using teamwork to take down a big baddie. It is a miniatures game at its heart, focusing on 'the path of a hero' - taking an average nobody and watching how they change as they have adventures, learn the mystic arts, and grow to incredible heights of power. You will be able to mix classes and powers as you level up. When a high-level warrior slams his boot on the ground, it should literally shake the tabletop. 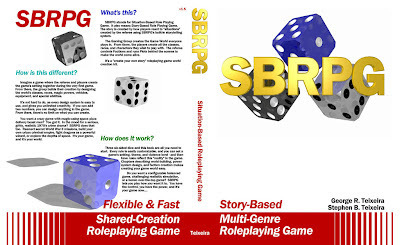 SBRPG 1.0 was developed before the 3rd edition of the world's most popular fantasy RPG was released, and continued in development until it was released in 2005. It's focus was off the tabletop, with story-based roleplaying dealing with factions, NPCs, and group-created game worlds. Characters here started out at a low level of power, but fundamentally had the powers they needed to begin. It was, and will be a different focus than Delta. Characters in SBRPG start out a fighter or wizard, and continue on gathering fighter or wizard powers (of the players own design) until they reach maximum level. It is not about a 'find yourself' character build system, it is about being a 'level 1 rogue' and progressing with a custom rogue build all the way up. SBRPG 2.0 will follow this design philosophy, and also strengthen the story and faction elements. It will be tailored to verbal roleplaying where groups share the world and create new things together. This also follows our philosophy as 'games as books' - we don't really believe in one 'master system' to rule them all. To us, you write the game to enhance the experience of play. Games should be simple enough to pick up, so learning them doesn't get in the way of having fun with them. Monopoly (tm) has different rules than Risk (tm), but both are simple enough you can pick up and play them with ease. Saying that in order to play board games you need one 'master board game system' for all family board games is kinda silly; and for RPGs, gets in the way of crafting a custom experience for your readers and players. I blocked out some initial design work for SBRPG 2.0 today, and kept going back and forth on several improvements to the game. I want to keep power design in the game, and not use fixed upgrade lists for powers. The goal of SBRPG is to let players design their powers, and not force everyone to play the same type of character, with similar complexity of play. That was a great strength of the original game, your class complexity was determined by you, and not the game. I've played many MMOs, and I am weary of being forced to mold my ideas into the MMO designer's idea of a particular class. Some MMO character classes are just so complex to play, while I enjoy that once and a while, being forced to master a complex class when my idea of how it should play is a simple one breaks my expectations, and leads to disappointment. A good example of this is a typical MMO rogue class. They can be fairly complex to play in a game, with stealth, DoTs, special moves, powers, stun locks, condition adds, and all sorts of other tricks you need to master to play them to their full potential. If my idea of a rogue is a swashbuckling pirate who swings a sword, uses some fancy footwork, and parries with clever repartee - I am all of a sudden not playing the MMO rogue to its full extent. As a result, my rogue's DPS suffers, I am not playing my class, and unhappiness results. The same thing happens in pen-and-paper games that too tightly define a class role, and expect you to take the per-described builds, powers, and upgrade paths. My idea of what a rogue is will probably be different than the game's, and I am back to my MMO-disappointment again. A balanced power design system that lets you take whatever powers you can afford was SBRPG's answer to 'playing what you want to play' - and it will remain so. Thinking about the Quick Primer for Old School Gaming again, the role of the referee has changed over the years. In old-school thinking, the referee acted as the creative interpreter of results. This was both good and bad. It was good, since someone needed to interpret the dice rolls, run monsters, apply effects, run the world, and make the magic happen. The bad side is an overly controlling 'referee as god' overkill. In newer games, especially the D&D wargame-style editions, the referee's creative role has been reduced to something like a wargame referee. Now, good referees never let books or rule-sets tell tell them what to do - this is a given. Also, the de-facto statement in most every RPG is 'if it is not fun for you, ignore it!' However, there are trends, and in rule-heavy games the role of an active referee moves more towards the game-shop owner in a magic card tournament, someone who adjudicates rules, solves arguments, and acts as the final word. With a module where every encounter is basically a preplanned figure combat, referees can feel marginalized to just another player who just moves the monster figures and references rules. That said, I loved D&D4, and play Pathfinder regularly, both are great games. I do feel something is missing from each of them that keeps them from capturing the 'true' feel of role-playing games when we started this hobby. D&D4 at times can feel too much like a figure game, like Warmachine (another fun one). Pathfinder's rules are complete, sometimes so complete they are too much, and the reference by both players and the referee feel like they weigh down the game. I enjoy them all, but I'm honest, there are parts I don't enjoy about their size and complexity. Coming from someone who's own roleplaying game ended up being the size of a phone-book, I know, it is a bit hypocritical lol. It is something called perspective, at the time, when we were new RPG authors, writing the largest game ever seemed cool. We started with a simple game that could have fit into a pocket-box, and then just kept writing and creating like crazy. The end result was heavy, even though the core was simple, the weight of rules needed to support what we created made the game heavy and unwieldy. I find myself reading old-school games like Basic Fantasy, Labyrinth Lord, and I want to get my hands on Swords and Wizardry. Small books, referees with creative freedom, simple rules, and complete packages in functional packages. I also dig the spiral bound books that Lulu sells that lay flat during play. In all these games, the referee's default role is free, the rules are guidelines for the referee, and all players need to worry about is what is on their character sheets. There is a zen to this design that I would love to capture with a future RPG, and I would love to take the creative narrative that was the sole province of the referee, and share it among the entire group of players around the table. Creativity shared among a group is the magic I want to capture, and having the referee be the director of this orchestra is my dream. How do I increase my chance to hit? How do I increase my damage output? How can I help my party members? GM: "The goblin snarls, and swings his axe wildly. You are AC 5, and checking the chart, he needs a 14 to hit you. A roll of 3 is a miss, and a pretty sorry roll. The goblin's axe embeds itself in the wooden post next to the table, and he struggles to free it. All right, what do you do?" Player: "I fall back behind the table, and kick it over onto the goblin. Attack roll is a 17!" GM: "Nice roll, the goblin is AC 6 so you only needed a 13. The table slams into the goblin, crushing him against the post, killing the goblin. Also, the food and plates on the table shower into the two archers behind it, a bowl of mashed yams landing on the head of one, the other wiping food from his face. They lose their next turn of firing. Next!" Combat is fast and loose, and a lot of it is up to the referee's imagination and the dice. Good rolls mean good things happen, and bad rolls mean otherwise. Referees are free to interpret results, add extra damage, throw out bonuses and penalties to hit, apply injuries and conditions at will, and interpret the chaos as fair as possible - with an eye towards being entertaining. GM: "The goblin snarls, and swings his axe wildly. You are AC 16, so he needs a 16 to hit you. A roll of 3 is a miss, and a pretty sorry roll. The goblin's axe embeds itself in the wooden post next to the table, and he struggles to free it. All right, what do you do?" Player: "I fall back behind the table, and kick it over onto the goblin. I only move 5' as not to trigger an attack of opportunity. Attack roll is a 17, plus 4 is a 21." GM: "That is like an unarmed attack action, so it triggers an attack of opportunity, and the goblin gets another attack." Player: "Give me a break!" GM: "No breaks, rules-as-written for this example.This is also like 'move a heavy object' so it's an AoO. Goblin rolls 11, a miss." GM: "Let's get back to your nice roll, the goblin is AC 16 so you only needed a 16. This is kinda like falling 10-feet, so I rule it's 1d6 damage, plus a reflex save to see if the goblin jumps out of the way and isn't therefore pinned (cannot move, -4 AC).The table slams into the goblin, crushing him against the post, and he takes 3 hp damage. Reflex save DC is, um, 15, with a +2 to the roll due to the goblin's REF save. And he rolls a 9, so the goblin is pinned. Also, the food and plates on the table shower into the two archers behind it, a bowl of mashed yams landing on the head of one, the other wiping food from his face. Let me make some fort saves for them to avoid blind conditions.... Next!" GM: "The goblin attacks. You are AC 16, a roll of 3 is a miss. You're up." Player: "I fall back behind the table, and kick it over onto the goblin. Five-foot move, no AoO. Attack roll is a 17, plus 4 is a 21." GM: "Move a heavy object' so it's an AoO. Goblin rolls 11, a miss." GM: "The goblin is AC 16 , hit. 1d6 damage, plus a reflex save or pinned. Goblin takes 3 hp damage. Reflex save DC is, um, 15, with a +2 for REF. Rolled 9, goblin pinned. Other goblins go now." A good DM will enhance the experience no matter what you are playing, no question. The less rules, the greater players can influence the outcome of combat with imagination and clever strategy. Modern games with their tabletop roots tend to make everything a wargame, and drain all the fun out of combats. When you are busy remembering and applying rules, there is less time for creative inspiration. Another issue comes up where players in old-school combat resolution simply have more options to increase their combat power than do players in more modern versions of RPGs. In the old days, it as common to throw out huge bonuses or penalties to-hit, damage bonuses, injuries, or conditions based on what was happening at the moment. Jump attack hits? Great, you do double damage! Shining a light into the dragon's eyes with your mirror shield? He gets a -4 to-hit as long as you keep that up. A great player could think of all sorts of ways to take advantage of a situation, and therefore the PC's combat power went up significantly. Again, the difference between a good player and a great one was purely based on imagination and creativity in combat, and not the memorization of the rules or ability to apply a character build. Over the weekend, I read the Swords & Wizardry Quick Primer for Old School Gaming. This is a great read, highly recommended, and it brought up a thought, what is player skill? GM: "You see of door with a brass padlock at the end of the hall." Player: "I carefully examine the lock, and try moving it slightly with my dagger." GM: "The lock appears normal, but you notice a small needle trap concealed behind the lock on the door...."
Player: "I carefully bend the needle so it pokes into the wood of the door, disarming the trap." GM: "It bends easily, but the padlock is still secured tightly." GM: "Make a search roll, DC 20." Player: "My positive mod is 8, I rolled a 14 on the d20, totaling a 22 - success." GM: "Roll a disarm trap check, DC 18." Player: "I roll a 13, plus 9 for my skill, which makes a 22 - success." GM: "You see of door with a padlock at the end of the hall. Roll a search roll, DC 20." GM: "You spot a needle trap behind the lock. Roll a disarm trap check, DC 18." GM: "Trap disarmed, roll a DC 25 for the lock...."
In the old days, the most important measure of player skill was the cleverness of the player. With more modern games where every skill is vectored out, and every ability completely written out in the rules, the measure of player skill is the player's knowledge of the rules. Now, a good referee will factor in the player's smarts during a game, no matter what they are playing. The difference is in games where there are rules for everything, how you measure a good player relies more on character builds, math, and the ability to memorize and cross-reference rules. In the old days, there wasn't much support for builds, skill rolls that interact with the environment, and building a character with formulas and DPS calculations. You did your best with what you had, and you twisted fate into your favor with how clever you played your character. It is a huge difference, and one of the reasons behind the OSR's popularity. How do we get back to games that reward clever players, and not rote memorization? This means no “story preparation” time is spent between games - only bookkeeping such as Faction Reactions. During the game, the referee must improvise when a situation comes up. This doesn’t mean the referee “makes everything up” as the game is played. Systems such as Ripples and Faction Reactions exist to direct the action by suggesting Factions do in response. It’s up to the referee to decide what they do, implement plans, and keep the players informed of what’s going on. This doesn’t limit the creativity of the referee; the referee is responsible for playing every Faction’s NPCs, and imagining, launching, and running Plots. There’s plenty of room for a referee to use their creativity within SBRPG’s storytelling systems. We have found SBRPG’s storytelling systems frees up a referee to be more creative, by “automating” many of a referee’s tedious tasks. You are the referee, and you control the action as it happens. You decide what a Faction does during a Faction Reaction. If a player crosses a Faction, you get to decide how the Faction’s NPCs react. Not only that, you get to set up every scene players find themselves in; and create the challenges, situations, and opponents that will face them in those scenes." This comes right after the player's role description, and lays out the role of the referee in the game. This is kind of like D&D 4's referee, where he runs things and keeps the session going, but a little more interactive and fun. Think of the game world as a huge sandbox game, like GTA4, Saints Row, or an MMO...well, maybe not like an MMO, but a sort of "big world with action and things happening on their own." Once a faction is created, the referee takes control and spins it off on its own. The fun comes when the players start being players, and cause trouble, get involved, and start making ripples in the world. The referee consults some charts, gauges reactions from various factions and characters, and says, "What comes next?" Of course, the referee can always come up with set piece locations, draw maps, and do all sorts of creative prep work. Ref's prerogative. Most of the ref's work is keeping track of the chaos players cause, tracking things happening in the world, coming up with faction NPCs, running to opposition, and being the master behind the scenes. The players really are enough work to handle, so we wrote out all the boring referee-work from the game, like drawing maps, writing scripts, and scripting set-piece adventures. Yeah, it's referee-fan-service, but they loved it. After 30 years of me having to write adventures for game sessions, it was justified referee fan service. It's also how I love to play, and it was fun to share with our fans. Quotes #3 - Players: Get Involved! "A player’s best trait is motivation. You have to be a self-starter in this game. No one is going to write an “adventure” for you, so get off your chair and make something happen! If you want to be a hero, get out there and find an evil to stop. If your goal is survival, actively pursue making yourself safer. If you don’t know what you want your character to do, at least do your Character Class’ job - something will eventually come up. Becoming actively involved in the Game World only increases your enjoyment of the game. In SBRPG, players design Character Classes to be part of the Game World. Well designed Character Classes always have something to do, and are closely linked to the conflicts and Factions in the Sandbox. There are no generic roaming “adventurers” in SBRPG’s Game Worlds, as everyone is involved with the action. The Genre (Setting, Theme, and Mood) helps further define and focus what is going on, and keeps players from feeling they are “left out” of the action. In traditional roleplaying games, the players are entertained by the referee’s premade story - just like the audience for a movie. Pre-written adventures are the “script,” and a cast of NPCs waits to deliver their lines as part of the referee’s carefully created plot. Adventures play like a typical fantasy movie: battles happen on cue, the evil dragon is slain, the princess is rescued, and the credits roll. In SBRPG, the players write the story, and help create the Game World - as it is played “live.” The players become the characters in the movie, and nobody knows where the action will go next, not even the referee. The storytelling systems in the game create an unpredictable element, immediately used by the referee to answer the question: “what happens next? The action in SBRPG is unpredictable: battles rage between Factions on their own, a player allies with the crafty dragon, the princess escapes and has to survive on her own, and the movie never ends. There is no script." This is from Chapter 3 again, and explains the role of players in the game. It is quite different from your traditional RPG, because most of the game world is made up on the spot, by the players around the table, during play, live. How does that work? Let's say your turn comes up to play, and you are a private eye researching a case. You know nothing about the world, other that maybe you are in New York City in the 1950's. What now? Well, you tell the referee, "I have a contact I know, down at the local bar." You create the contact, the bar, and the details. Bonus points if you write the notes for the referee. Bang, it's added to the game world. What's the balance? Well, once something is added to the game world, it's fair game by the referee, other players, or anyone else in the group to modify. It becomes a piece on the sandbox controlled by everyone. There is no "these are my things" in the game, it is all owned, created, and shared communally by the group. After a while, when the world is set, most NPCs, factions, and locations revert to the referee's control once things are established and running. It can be a challenge to referee, but extremely rewarding. As a referee, it is extremely fun to see what players come up with; and as a player, it is addictive fun helping create the world you are playing in. All the groups we played with 'got it' and worked together, rolled with the punches, and built cool things together. "No game like it," Remarked one player. This was the cover of the SBRPG rulebook, it was a beautiful piece of work. The dice were done in 3d, it took me about 8 hours of work to get the dice high-resolution enough to use for the cover. Even then, the pips had significant faceting that I had to eliminate in post-work. You see, at this time, all we had was a copy of Ray Dream Studio 5 (nowadays they call it Carrara 8 Pro). As you can see from the spine, it was a thick book. The dice were rendered at full size, something like 8000 pixels across, along with the true-3d gold lettering of the title. You can probably see some of the faceting in the backface pips, but I labored for hours getting rid of those imperfections and making those dice sing. The reflections and light play inside the dice were limited by our software, something I wish we could of made sparkle and refract light all over the place. The dice flying off on the back cover (right) are perfect, dynamic, and express action and fun. I love the reflection in the top black dice, it gives the back cover pop and dynamism. The cover still stands up well, even to today's standards. Both George and I studied graphic arts with one of Ben & Jerry's Ice Cream's original graphic artists, so we kinda have a knack for design and layout. The cover was stark white, leaving the rest up to your imagination. I came up with the red bar and racing stripes, an element that was used on the chapter heads inside. The contrast between the front cover (dice ordered and ready), and the back (dice in play and in mid-roll) is something that we thought was cool, and captures the ready-set-play nature of the game. It also expresses the action and dynamic nature of the rules very effectively. It is a cover that holds up well, and I am still very proud of this to this day. George and I had this discussion in our local breakfast place yesterday morning, "Was SBRPG a generic system?" George said yes, it was generic. I said no, it wasn't. George countered by saying, "A generic system can be used for any situation, any time period, and genre. SBRPG supports everything, so it is a generic system." By now, the people around us thought we were probably crazy or very strange, but hey, we are big-time game designers, so we can talk shop in public like rock stars. I countered, "A generic system implies that it is a cookie-cutter, handle-everything system. SBRPG wasn't written that way, it supports playing in worlds designed within itself. You can call it generic, but the intent was to support a specific game world written by the gaming group." Melissa, the coffee-shop gal, must have endured a half-hour of our silly argument, and in the end, we agreed both points were valid. George was right in a way, SBRPG handles anything you can throw at it, so it is technically a generic system. I'm writing the blog, so naturally, I get the last word (unless George jumps on here). My view was a little more broad, SBRPG was written to support creating worlds and situations first, then playing in them. In that view, it is less a generic system, and more a RPG simulator. A generic system supports roleplaying within an established idea or volume of intellectual property. SBRPG takes a step back, and forces you to create that idea or property first, then lays out rules of play within it. It is a sandbox RPG in its heart, where creating the sandbox is as important as playing the game. You could create a perfectly-photocopied sandbox out of someone else's IP, use SBRPG as the ruleset, and then say, "there, generic system," but that is not the point, nor the focus of the game. Our players picked up on that, with one of them commenting, "This is truly a unique game that has its own approach." People enjoyed being able to build game worlds together, the players and the referee all contribute equally to the process - more on that in future posts. Everyone contributing, laying out pieces, and sharing ideas to create a unique world needed a generic system to handle resolution, which we provided - so there is a generic system in there. In the larger view, SBRPG did one thing, shared world creation and play, very well, which breaks the definition of what a generic system should be. Way back, post-D&D 3.5, post-SBRPG, and pre-D&D 4.0, I filled out an employment application for a game designer at Wizards of the Coast. To my surprise, I got a reply, and a chance at a second round, sort of a hiring quiz. I wrote out my answers, and then rewrote them (much to my dismay, my first set was better - I was more honest). Needless to say, Wizards hired someone else for the position, which is cool, I love the company and what they do. I could have kept pursuing jobs at Wizards, but another opportunity came along, a chance to work for the rock stars over at DAZ 3D. I jumped at the chance, and put aside my life as a roleplaying game designer for a couple years. Working in 3d was cool, and eventually my brother George came on board, and we changed the game at DAZ, and rewrote the rules on QA. Well, actually, we wrote the rules, 200+ pages of how you QA things in 3d. It was a first for the industry, and still shapes how things are done in the entire Poser-verse. So in a way, we were still designing systems and how things should be done. I wonder what things would be like if I were hired over at Wizards, and had a chance to work on D&D 4? Working there has always been a dream of mine, and having my name on a piece of gaming history would have been really cool. To this day I still wonder if they managed to get a copy of our game and read it, again, that would have been cool. I made up for the karma-loss a little bit by running the in-house D&D games at DAZ 3D during the weekends. DAZ is a cool place to work for, they let us use the conference rooms, tables, and whiteboards on the weekends. For a large group, having the building to ourselves was gamer heaven. Officially, it was our 'team building exercise' on the weekend, getting co-workers to know each other and work as a team better. For those involved, it was a chance to share what we loved doing the most. "One rule you must follow is to purge yourself from any fictional source material. Stay away from movies, novels, and comic books. Why? Those sources are other people’s ideas of potential Game Worlds, Factions, special powers, and settings. These “franchises” are so culturally powerful they will subconsciously take over your game by their mere presence. The goal of SBRPG is to create something new. Yes, all these ideas are imaginative; but you’re skipping a lot of the basic creation of a Game World that’s fun to do, and ultimately more rewarding. These authors created their own “Game Worlds,” and then set about telling their own story in them - just like you will. Make sure your idea is not a copy of them either, and give yourself some “breathing room” between creating your world, and looking at something that inspires you. The worst way to make an original Game World is to start by watching a movie, or reading a book. Develop your idea in your mind, twist it around a bit, and present it to other players in the group. Try to surprise them with how original your idea is, and then work together trying to combine your inspiration with theirs." I took this section from chapter 3, Playing the Game. It's pretty bold, but in essence, it defines what we tried to do. Popular culture is so powerful, the stock monsters and spells of other RPGs are so prevalent, the movie of the moment is so in everyone's heads; it takes a conscious effort to divorce yourself from those influences, and do something new. It's not bad to play in someone else's copyrighted property, and we didn't want to leave that impression. If you are happy playing D&D, a game based on Tomb Raider, Star Wars, or any other property - more power to you! You are role-playing, and that's a good thing. But those worlds and idea have games written for them, or other games easily adaptable to them. We chose to purposefully NOT support that, and forced players to be creative. The rule was - you must create something original. Reports from the field were cool, and it was always a blast to hear of people's wild creations. People made werewolf-hunting games mixing magic, swords and bullets; near-future spy thriller worlds; fantasy worlds with only two races at war; street racing games; original sci-fi worlds with exploration and conquest; and much more. It was a fun and creative time, and some of our players were inspired to write fiction about their creations. I hope their books worked out, and they were able to publish and share with others the things they made. We had a quote later in the book about "SBRPG to roleplaying is like drawing in the negative space." Forcing people to get out of their element, away from pop culture, and to be creative and original was a fun design decision on our part, and it made many people happy. What would you create if someone told you, be totally original? People let go, it was crazy and creative, and everyone had a blast. Getting people to open up and share is one part of SBRPG that will always stay with me. "If this is your first roleplaying game - save the feelings you now have. If this isn’t, try to bring back those feelings of wonderment and discovery. What did you expect when you first opened that box, or cracked the cover of the book? When you realized you could do anything, or be anyone you wanted to be, how did you feel? After your first game session, when you realized you had a lot yet to discover, did it excite your curiosity? That whole feeling of “starting fresh” is key to helping you enjoy SBRPG." This appeared at the end of Chapter 1, and was a call to players to try and recapture that feeling of wonder and excitement of cracking the cover of their first roleplaying game all over again. Rediscovery, re-imagination, that fresh feeling of discovery and amazement - that is what is important to feel again. Jaded roleplayers, like ourselves, are too often dragged down in the mud of system wars, disappointment, and saw-it-all-isms. We forget why we started playing in the first place - we did. This magic feeling is what we tried to capture. It sets you up for the path we took our players down, where the group decided together what world they wanted to create, what classes existed in it, what powers, what genre, what monsters, factions - everything was created fresh. It didn't take long either, all that work was often done in the first night of play. SBRPG was not the most complete or simulationist RPG, but it emphasized getting you started quick, getting everything decided, created, and play going tonight. Our goal was to get you back to that feeling of wonder we all had when we first joined our hobby as fast as we could.